The Scott E-Aspect 720 is an Offroad & electric Mountain Electric Bike. It is the hard tail version of the E-Spark 720 full suspension featured previously in the OnBike news. 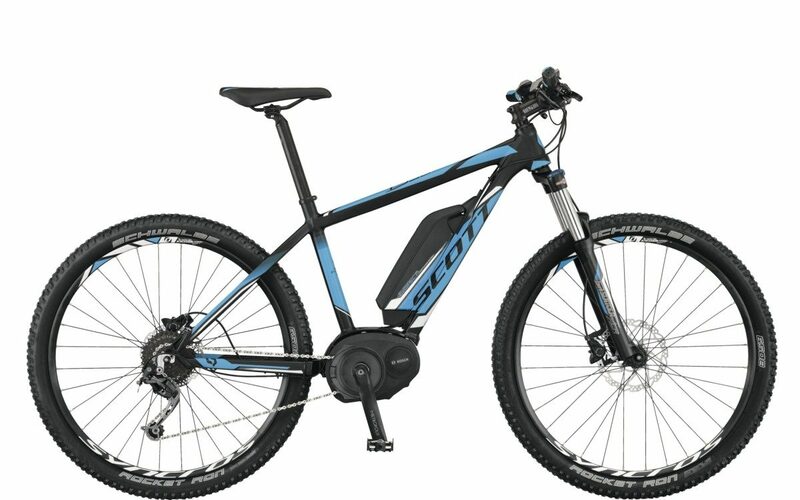 At a very affordable £2,399.00, the Scott E-Aspect 720 has a lot to offer for those who want a bit of all round action! At the heart of the machine is the Bosch Performance motor. Designed for powerful acceleration in hilly terrain, this powerhouse delivers 60Nm of torque. The 2014 design improves on that of last year, and has more powerful electronics. In addition, it has a low-vibration motor, and is low volume and weight. The Scott E-Aspect 720 ebike benefits from an optimised 3-sensor concept. This fine tunes the power delivery through a 1,000/second measurement process. The result is a smooth and powerful delivery. The Bosch drive is complemented with the crystal clear Intuvia handlebar display, and 400Wh Powerpack. Gearing is via the Shimano Deore RD-M592 SGS 9 Speed derailleur. This combines with a CS-HG30 11-34T cassette, and is responsive and smooth. The wide range of gears mean that demanding terrain is easily achievable. At the same time when speed is needed, gearing is comfortably there when required. There is however, no need for concern as to whether or not all this power can be tamed. The braking system utilises hydraulic Shimano BR-M447 Discs on 180mm SM-RT54 CL Rotors. This produces sharp, effective and responsive braking. The Scott E-Aspect 720 Electric Bike sits on Schwalbe Rocket Ron 27.5″ x 2.25″ tyres set on Alex X37 650b rims. Suspension is through Suntour XCR-LO forks with Lockout (100mm travel). Altogether, this ensures every ride is invigorating, fun and comfortable. This rugged yet beautifully crafted ebike is a must for all terrain riding. Its strong frame comprises 6061 alloy with double butted tubing. This ensures a reliable and rigid performance. With such high level components, the Scott E-Aspect 720 Electric Bike is a real winner!